SGM Orbital shaking incubators are specifically designed to have combined advantage of closely controlled incubation/storage-temperatures with orbital shaking necessary for many laboratory procedures such as tissue cultures, fermentation studies, enzyme reactions, controlled Incubation and aging tests, growth studies etc.Brushless Induction drive motor with frequency drive makes the unit suitable for continuous non-stop operation. Stepless electronic frequency control ensures gentle start and maintains speed. Compact counter balanced drive mechanism ensures high stability and reliability even in continuous operation & uneven load distribution. 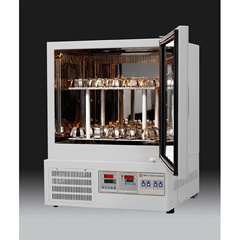 Some Shaking Incubator (Environmental Shaker) applications include cell culturing, cell aeration, and solubility studies.Agitation speed and orbit affect both the aeration and the mixing of the culture. The outer chamber is made up of M.S. Sheet duly painted and inner chamber of thick S.S. Sheet. The Gap between two walls is fitted with high grade glass wool to avoid thermal loss. The plexi glass window makes it possible to inspect the specimen without disturbing the inner temperature. The lid of chest type units fitted with fluorescent tubes of 60 cms, Length, on the inner side. The unit has a temperature range From 5°C. When the tube lights are ON temperature range is from 10°C to 50°C circulation fan is fitted to maintain temperature uniformity throughout. Cyclic illumination conditions are controlled by an automaticTimer (0-24) fitted to the unit. It is fitted with DIGITAL SPEED METER (RPM COUNTER) for shaking Platform having VARIABLE SPEED. The shaker has variable speed and a platform containing 16 flasks of 500ml or 40 flasks of 100 ml or 34 flasks of 150 MI capacity is supplied with the unit as standard Accessory. To work on 220/ 230 volts A.C. Supply. 1. Inner Chamber S.S. 304 & Outer chamber M.S. powder coated with Plexi glass inner door. 2. Variable speed from 20 RPM to 250 RPM. 3. Digital display of speed with preset facility. 4. Shaking amplitude 25 mm.